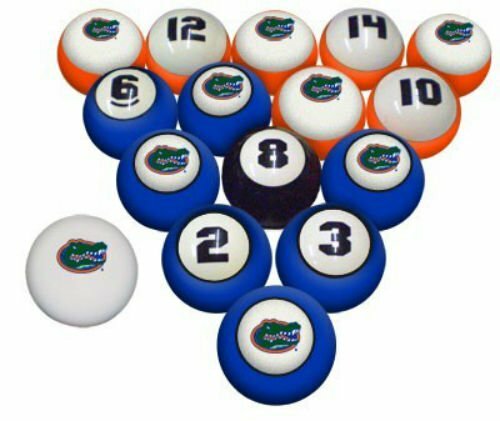 Our NCAA officially licensed Florida Gators billiard ball sets are made from high quality resin and are official size and weight which meet the stringent standards of the Billiard Congress of America. Unlike other screen printed and coated ball sets, this billiard ball set is imprinted with your team logo through a high tech heat transfer dye process with the image being permanently "embedded" so it will not crack, chip, split or peel during play. Our ball sets also are unique in design so that each ball has the team logo on one side and the ball number on the other side with traditional billiard ball colors. With our set, you can play all popular billiard games. Set comes with 15 numbered balls and a team logo cue ball. This set will definitely be the talk of the party. If you have any questions about this product by Southern Game Rooms, contact us by completing and submitting the form below. If you are looking for a specif part number, please include it with your message.